The first season of Channel Zero, Syfy’s creepypasta-inspired anthology series, explored the nightmares of Candle Cove, a sinister TV puppet show. Season two, No-End House, features a new story, a new cast, and an even more dreadful evil. If you thrill to mind-warping horror stories, you do not want to miss this. Channel Zero: Candle Cove was about a man haunted by the faint yet disturbing memory of a secretly demonic children’s TV show, as well as the obviously related loss of his twin brother. The season crafted a complex story from a brief creepypasta tale that was written in the style of an online message board, an impressive feat. Candle Cove also poked into some dark places and yielded some very unsettling images (two words: Tooth Child). But it faltered a little bit when—after six episodes of slow-burn doom—it tried to explain its central mystery away too quickly. No-End House is drawn from a longer original tale, though it’s just as “creatively inspired by” (rather than “faithfully adapted from”) its source material as Candle Cove. No-End House also deals with some similar themes, including family relationships that come unglued over time, and what happens to people when their memories become unreliable. This time, however, the story is much more satisfyingly structured, and the characters feel way more relatable. As a result, the traumatizing stuff that happens to them makes a much greater impact. Jeff Ward as Seth and Aisha Dee as Jules. The two young women at the center of No-End House have been best friends since childhood. Outgoing Jules (Aisha Dee) has just wrapped up her first year of college; quiet Margot (Amy Forsyth) is still living at home and dealing with the sudden loss of her beloved father one year prior. There’s tension between them—Jules feels guilty over not being there for Margot in her time of need, and Margot resents Jules for the same reason—but they’re still going through the motions of being BFFs. John Carroll Lynch as Margot’s father. Things get... even stranger from there, and No-End House does a great job of balancing grisly body horror with waves of utter dread and, somehow, a few genuinely heartfelt moments. Margot’s excitement at seeing her father alive again (who wouldn’t want to steal a few more moments with a dearly departed loved one?) almost eclipses her common-sense reaction that, uh, something is very wrong here, because this is not possible. The show—penned by different writers under the guiding hand of series creator Nick Antosca—manages to flesh out this bizarre reunion in ways that are both scary and sweet. The other characters also evolve convincingly, with Lynch (last seen reprising his role as Twisty the Clown on American Horror Story: Cult) doing some heavy lifting as a guy who knows he’s not supposed to be where he is, but dangit, he loves his daughter and he wants to be with her. Just like Candle Cove, all six No-End House episodes were helmed by a single director with an indie-filmmaking background, which makes for an excellent sense of visual continuity. This time around it’s Steven Piet, who brings undeniable menace to the flat, relentlessly beige suburban neighborhood that surrounds the titular attraction, a pointy, murdered-out dwelling with a plaque out front that attributes its construction to an “unknown artist.” Though No-End House spills some secrets at the end, there’s no meta-reveal—no moment where we learn exactly who made the house, and why. Instead, we’re left with a palpable sense that we’re better off not knowing, and the show is ultimately stronger (and scarier) for it. 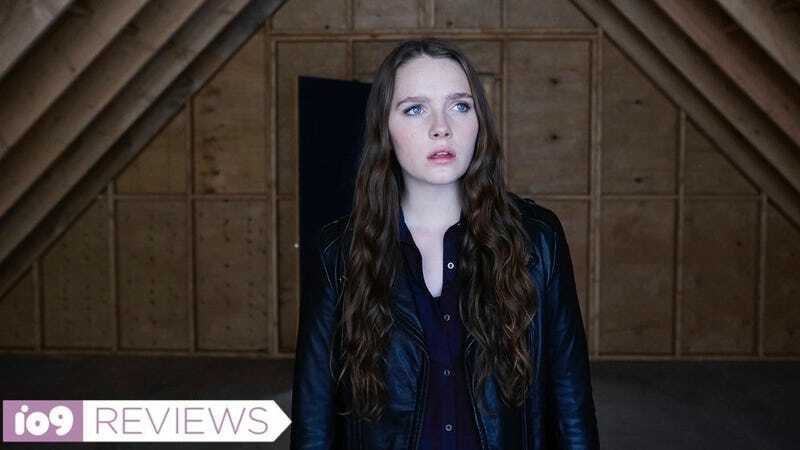 Horror has rarely been one of TV’s most popular genres—aside from American Horror Story, which has been a chore to watch this season—but a show like Channel Zero, which mixes intriguing storytelling, artful execution, and disturbing frights, could help change that. The anthology series has at least two more six-episode seasons on the way (Butcher’s Block in 2018, and Hidden Door in 2019), we can’t wait to see how this show will terrify us next. Channel Zero: No-End House airs Wednesdays on Syfy.